A few weeks ago, The Alemonger sent me a photo via text (for those of you that sweat the details, this happened on February 23rd at 5:01 PM) of the latest Maine Beer Company beer (i.e. Lil One) that he purchased at the Wegman’s Wine and Spirits store in Cherry Hill, NJ. Until I received his text, I had never heard of this beer. I like to think that I am up on the whole Craft Beer scene, but the truth is that there is way too much going on for me to keep up. During out brief text chat, he claimed that he TRIED to get me one, but alas, he purchased the LAST bottle in stock. Only The Alemonger knows what really went down that afternoon, and given his propensity for being tight lipped when the circumstances demand it, I suspect that I will never know the truth about the Wegman’s inventory at his time of purchase. Thankfully, after a brief dinner at Pei Wei with the wife and kids a week or two after The Alemonger’s text, I made a quick stop at the aforementioned Wegman’s Wine and Liquor store and managed to secure a bottle of Maine Beer Company’s Lil One for my very own. This is our big winter beer. Hoppy, balanced, and full of warm belly cheer. Kevin created this brew and named it after his newborn daughter. This one got brewed once this year, and we hope that it brings some light to these cold, dark months. Drink it fresh! Appearance: Cloudy red-orange color. Thick off white foam that maxes out at around 1.5 inches and then dissipates slowly. Clingy lacing as you drink it down. Aroma: Rich, resinous hop aroma upfront with a fresh baked shortbread cookie sweetness coming through in the background. Taste: Moderately carbonated with a very creamy mouthfeel. Starts off with that malty sweetness which has a cane sugar and honey like quality. The bitter hops kick in at mid-palate, but they don’t dominate the flavors since that sweetness is there to lend some balance. The bitterness intensifies at the finish, but never becomes overwhelming. Dry, astringent finish with the alcohol finally showing up to say hello. Maine Beer Company has done it again! 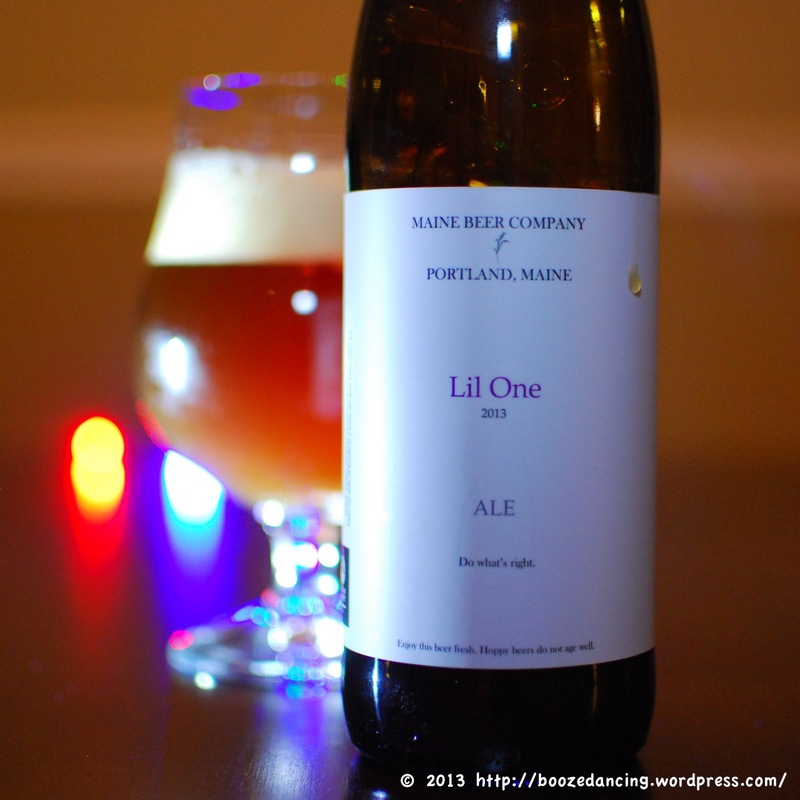 Lil One is one seriously flavorful, and beautifully balanced beer. It has some serious hops for sure, but it also has a solid malt backbone to keep those hops in line. I know their beers are a tad on the expensive side (this half liter bottle cost me $7), but I think they are worth every penny. Any brewer that goes to the trouble of printing “Drink it fresh!” on one of their labels FOUR TIMES is obviously very serious about delivering a quality product to their customers. Cheers to a job well done! What text? What picture? I have that Jodie Arias PTSD amnesia thing. Did I chop off the arms of that bottle and bury them in the neighbor’s yard (the one I don’t like). Did I mail them to the Society of Willem Defoe Impersonators? It’s all so confusing. But I remember the beer. These guys really are rockstars. I’m beginning to think they might be New England’s answer to Three Floyds though without the hype or colorful label art. I can’t imagine their capacity is any larger than Three Floyds either, yet they’re distribution footprint is much larger (for now, anyway). Hopefully they won’t contract their distribution and go to ground like Three Floyds did several years ago. Its time now to begin a sentence involving Jesse Ventura. And then to end it. Interestingly enough, they just moved or are in the process of moving to a larger facility up in Freeport, Maine. Hopefully that will help them keep up with demand. Of course the question is, will I be able to make a detour to their new spot on the way to our summer rental? I checked the map, and it’s actually on the way. Guess I should start sweet talking The Viking ASAP. With regards to the pic and text, it’s all on my phone! Everything I’ve had from these folks has been really artfully crafted, but not to the point of being dainty (looking at you, Allagash). I haven’t had this one, but I think I’m about to go all fanboi for these guys and explore their lineup. You are so right! These guys are rock solid. I have had every beer they make with the exception of King Titus Porter (per their website, they just brewed a fresh batch, so I’ll hopefully track one down very soon), and they have all ranged from very good to world class. First – very entertaining little share of your exchange with The Alemonger – quite funny! Secondly, that photo is really beautiful. You really have talent taking these boozy shots – I’m really impressed. Lastly, this beer sounds delicious! I’ve bookmarked it in hopes that I can find it (or something else by this brewery) for myself. Great post! #1 – The Alemonger is quite a unique individual! This particular text exchange actually made some sense. The man is loony tunes. In a good way of course! #2 – You are too kind! In case you couldn’t tell, I really enjoy the visual aspect of blogging. I’m happy to hear that you enjoyed it too. #3 – So are you telling me that you’re warming up to the world of Craft Beer? If so, that is fantastic! Much like whisky, this is a fabulous time to get into it, and Maine Beer Company is one brewery that I would wholeheartedly recommend seeking out. They are a crazy small brewery, but what they put out is delicious and beautifully crafted. But before I tell you to run out and buy a bottle, it would help to know what you’ve had and what you like. Do tell! Sadly I have nothing to say about Maine beers. I have heard great things though so I will be looking. Where is this Wegman’s again? You should definitely track these guys down! While they have limited distribution, they are popping up quite a bit in South Jersey and Philly. I’ve seen them at Beer Heaven and The Foodery in Philly, and at Wine Works in Marlton, the Wegman’s in Cherry Hill on Route 70, and at Canal’s in Berlin. Just be mindful of the expiration / bottling dates. Good luck! Those Maine brews are something great. I’ve only had a couple, but been reading about them for a while. Like G-LO points out, it’s great they’re committed to having people drink their brews fresh, and boy are they ever. If you can find their brews, don’t hesitate! Growing up with Wegman’s, I am supremely jealous they’re no where near me any more. Fantastic stores and it seems they’ve been putting a lot of effort into their beer selections in recent years. I’ve clearly got a soft spot for these beers, so I don’t think I need to elaborate any further. I’m on the fence about Wegman’s. While there is no denying that they have a sick selection of pretty much everything (I’m talking about the supermarket part of the store), the one near us is in what is quite possibly the WORST shopping plaza on the planet, so getting in and out of the parking lot is such a miserable driving experience that it’s tough for me to warm up to the place. All you need to do is look it up on Google maps (look up Wegman’s in Cherry Hill) to see how poorly it’s laid out. Then again, we are talking about New Jersey afterall. While I dislike the placement of their Wine and Liquor store too, I have warmed up to the fact that it’s a stand alone building which makes getting in and out of the place that much easier. It also helps that they have good and somewhat reasonably priced Craft Beer selection. Sadly, it’s in the same shopping plaza.